All my life, I knew I wanted to be a mother. 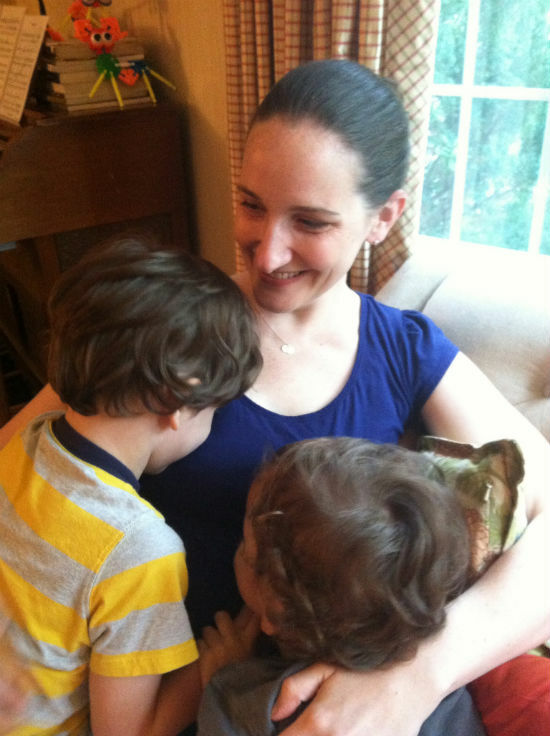 As an older sister, a babysitter, and a teacher, I trained for years for the day I would have kids of my own. For the first year after my oldest son was born and I morphed from a childless teacher in New England to a stay-at-home mom in the Midwest, I spent a lot of time telling myself how lucky I was to finally have this life I'd always imagined: a loving husband, a healthy and easy-going baby, a supportive family, financial stability, my own health. But I didn't always feel lucky. More often I felt sadness nagging like an arthritic joint, boredom like unwanted ballast, loneliness like a weight. For much of that time I tried to manufacture happiness out of busy-ness. At home, newly settled in a town without any friends or family nearby, I dedicated myself to becoming a perfect mother and household manager. I spent hours inventing ways to fill my days with activity. I scoured the parenting manuals and subjected my son to every physical and mental workout they prescribed. During his naps, I organized and reorganized our closets. I subscribed to an online service that bombarded me with e-mails reminding me to clean my toilets and scrub my sink. I took my son to the store for no reason other than the chance for some friendly chitchat with another mom in the diaper aisle. Like the mom at the town pool in her colorful print bikini with her long, blonde hair in perfect spiral curls, her equally blonde, equally perfect daughter splashing by her side. (Who wears a bikini to "Mommy and Me" swimming lessons? Who does she think she is?) I, feeling inferior in my six-year-old stretched-out black tank, my hair in the same ponytail it had been in for most of the past year, could never be friends with her. Or the woman in Wal-Mart in her flannel pajama pants with her two kids riding in the basket of the shopping cart. (Doesn't she know that they're supposed to be strapped into the seat on the front of the cart? Can't she even bother to get dressed before leaving the house?) I, feeling superior in my jeans and (only slightly wrinkled, slightly stained) cardigan, my baby protected by a germ-proof padded shopping cart seat cover, could never be friends with her. Not only did I not see myself in any of the moms I encountered, I dismissed them so quickly I made it so that I never could. Far from the epitome of domestic and motherly bliss I had always imagined, I had never before felt so disconnected or so alone. And it was my fault. One day I lamented my fate during a phone call with a long-distance friend and she recommended I check out a few blogs she had been reading. Equal parts curious (What is a blog anyway?) and skeptical (Why are these people putting all of their business up on the Internet for the whole world to see? ), I clicked around and found myself nodding in recognition at the words of these faceless strangers: Like the mom who cried in the parking lot in the front seat of her minivan after her toddler had a meltdown at Gymboree class. Or the woman who spent an evening eating a bag of mini Reese's Peanut Butter Cups after feeding her family an all-local, all-organic dinner. These women, I thought, were just like me. Eager to join them, I started a blog of my own one November night, the cold wind sneaking through the crack under the front door and hinting at the long, lonely winter to come. And with that first post and a few comments scattered like breadcrumbs, I set out on a journey into the wide, wild blogosphere -- a place that would become for me an outlet for the feelings and worries that were percolating inside my tired mind. I found online a village of other parents loving their kids all the while thinking the same kind of thoughts and asking the same kind of questions I was. I had no idea what they looked like or what they wore to the pool or the big box store. I didn't really know where they lived, how much money they had, or where they went to school. And I didn't care. In fact, I never really thought about it. With the external trappings of their lives stripped away, I ditched the judgments that I was so quick to heap on the people I met in person. And, in place of these judgments, I gave them my attention. And they, in turn, gave me theirs. Reading, writing, and connecting with the blogging world gave me a community and a niche within it -- as a reader, a writer, an inflexible yogi, a teacher, a talker. A woman who loves her children and also loves herself. But perhaps the greatest gift my blogging community gave me was one I never would have expected: connecting with other women online taught me how to connect with the other mothers I met in person. Once foolishly convinced that those moms in Wal-Mart and across the pool were interested in nothing but the baby food coupons and AAP vaccine schedules we chatted about, I finally started talking to them in the way I talked to my blogging friends. I asked them about their hobbies, the books they read, their work outside the home, their dreams, and their fears. In other words, I treated them like human beings. And I saw that these moms were just like me. Our kids were the emissaries that brought us together, but our connections ran deeper than that, through the fact of our shared motherhood and into the different facets of our identities. I am now the happy resident of a large community of mothers -- some of them live inside my computer screen, some of them are in my book club, some of them I see at preschool pick-up, and some of them I collapse into laughter with over cabernet and artichoke dip one Friday a month. But all of them have helped me redefine who I am. All of them have helped me find my own happiness. All of them have helped me be the mom I imagined I would be all those years ago. They say it takes a village to raise a child. I'm not sure if that's true, but I know it took one to raise this mother.